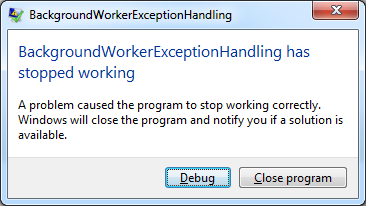 In this post, let us discuss about special exception handling mechanism for BackgroundWorker. 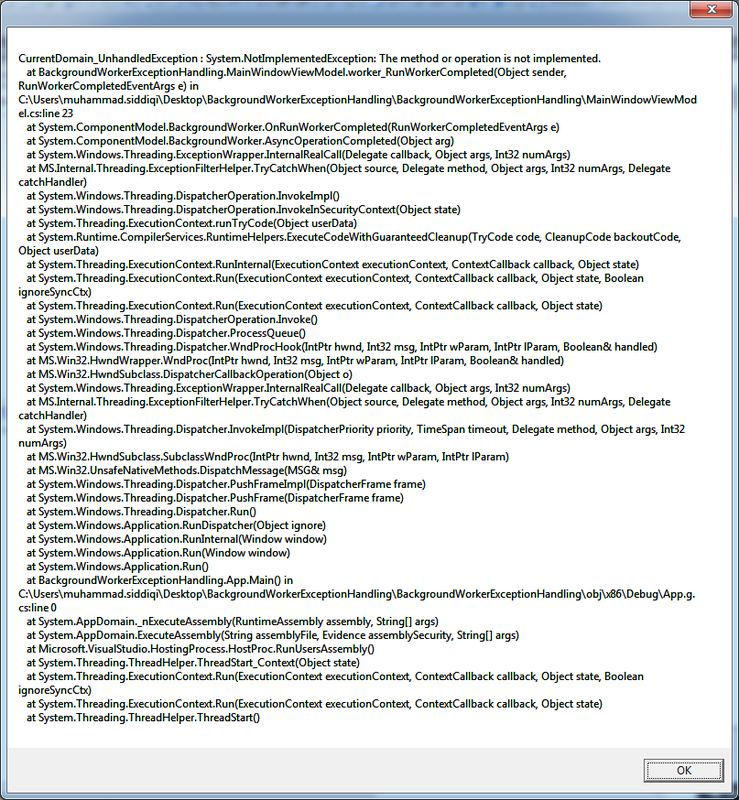 The above view is expecting a class named MainWindowViewModel and using that as its DataContext. It is also expecting that this view model has an ICommand property, StartWorkCommand. We are defining StartWorkCommand as RelayCommand. When this command is executed, we start a BackgroundWorker. Before that we specify handlers for DoWork and RunWorkerCompleted events. Now run the application. Still we are not able to catch it. What is going on? This seems weird as application is also not crashing which happens when there is an exception which is not handled in the application. This makes us belief application is handled somewhere. But where? Now when we run the application and click the button we get this message box. As we have seen that RunWorkerCompleted gets raised if DoWork is done execution as a result of completion of work, exception or cancellation from user. If it is raised for any reason other than completion of work then accessing result from RunWorkerCompletedEventArgs.Result would raise a new exception. If we don’t want to handle this exception here then we can just rethrow this exception as below. Then it would be caught by Application.DispatcherUnhandledException ‘s handler. In the handler for DispatcherUandledException, we have set Handled as true. 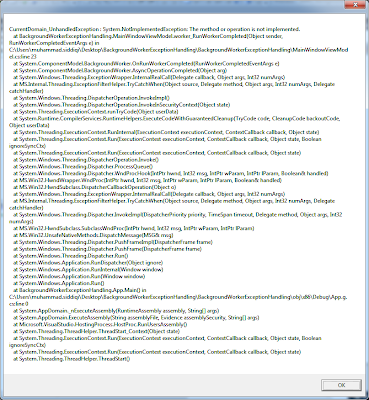 If we don’t do it then it would be caught by AppDomain’s exception handler for any thread. The following messagebox is displayed. In this handler, we can no longer stop application from shutting down.